What’s the difference between a meteoroid, meteor, and meteorite? Find out in our latest relaxation story where we match each to a yoga pose and breathing exercise. Feed your brain while you relax! This is our last episode before our winter break! We’ll be back in early January. The Northern Lights are a magical light show in the sky brought to us by Mother Nature! But what are they exactly, and why do they appear? Today we are going to explore the science and the stories behind the Aurora Borealis while we breathe and stretch. And just like that, we’re back. Thank you for your patience as we take a little break to rest and get ready for this new season of Peace Out! This season we’re heading out to space, and with that, we are introducing a new feature: SafeSPACE. 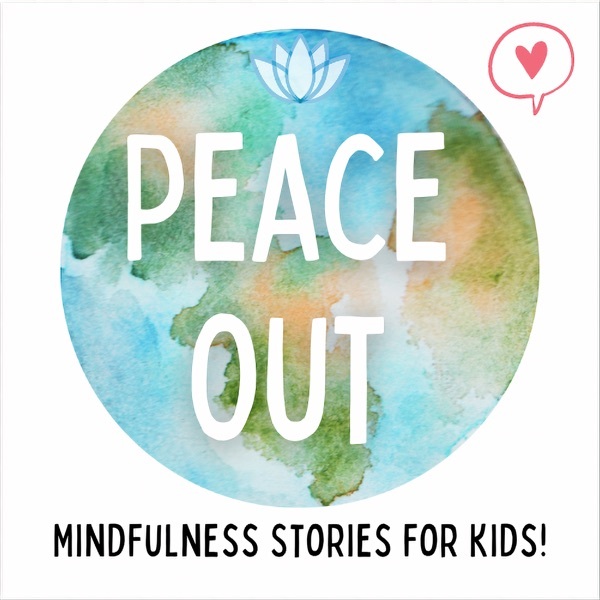 If your child would like to share where/who/what their safe, happy, or calm space is, please send in a recording of them, picture, or message to peaceout@bedtime.fm or on our Facebook page @bedtimefm or Twitter @peaceoutpodcast. We’d love to hear what makes them feel this way and why and we’ll share it on a future episode or on our social media! Full transcript of each episode is available on our website, www.peaceoutpodcast.com. Peace out and peace within, Chanel P.S. I have a personal gofundme page that I’d appreciate you checking out. Go to https://www.gofundme.com/peace-out-yoga-teacher-training. Thanks for reading! Jealousy is a hard emotion to deal with or even admit to being. It brings out negative feelings that make us feel bad about ourselves. Kaala is feeling jealous of Chuff in today’s story and has to deal with those feelings. Find out what she does and how you can get over the feeling of jealousy too. Check out the links below for more resources on jealousy including sibling jealousy. A relaxation story for children ages 5–13 years old. We take a short break from the main Peace Out story to bring you a mini mindfulness story. In this mini episode, we are pirates out on the open sea and it's about to rain. This mindfulness story is suitable for children ages 5-12 years old. This week Kaala is making plans to go, but is starting to worry and feel anxious about the huge journey ahead. When was the last time you felt worried about something? Everyone worries and feels anxious sometimes, but what can we do about it? A relaxation story for children ages 5–13 years old. For our friends in the Southern Hemisphere, the part of the world that is below the equator, it is autumn. Here’s a special autumn relaxation story for you! Let the beautiful colours of autumn leaves fill your imagination as we toss and make leaf angels in them! You will need a lot of room for this one, so make sure there is enough space around you before you begin. A relaxation story for children aged 5 - 12. Put on your helmet and hop on your bike for a ride around in your imagination! Today we’ll focus on visualization and movement as we imagine our journey, ending with a head-to-toe relaxation exercise while we consider how we are all connected to each other and the earth. A mindfulness story suitable for children aged 5 – 12 years old. Ladies and gentlemen! Boys and girls! Welcome to the greatest show on earth: Circus Spectacular, starring YOU! Join us as we use our body and mind to imagine ourselves being contortionists, clowning around, and flying through the air on a trapeze! A fun relaxation story to wind down to in the classroom or at home. A mindfulness story suitable for children aged 5 – 7 years old. Unicorns are everywhere lately, don’t you think? Books, movies, stickers, hairstyles, even coffee drinks! It’s probably because they’re such cool magical creatures, So Peace Out decided that it was time to feature Unicorns in this week’s relaxation story, I can’t wait! Let’s get started now, this is going to be great! A mindfulness story suitable for children aged 5 – 7 years old. Music can inspire, excite, and even calm us. Today we are going to practice focusing by listening to a piece of classical music. Whenever you notice yourself thinking of something else or your attention drawn somewhere else, it’s okay—just refocus on the music. It will take a lot of practice (millions of adults practice this everyday when they meditate) to focus so this can be an episode you listen to more than once. There are no movements so it’s a great one to listen to in the car too. A mindfulness story suitable for children aged 5 – 10 years old. Welcome aboard Bedtime FM Airways! This is the final boarding call for anyone who is in need of a relaxing mini mind vacation! Fly with us through the clouds as we stretch, breath, and imagine our way to our destination: your favourite place on earth! A mindfulness story suitable for children aged 5–10 years old. Everyone gets angry and feels upset sometimes, but when you do, do you react or respond? There’s a big difference between reacting and responding, and in today’s episode, we talk about how to be more mindful of our emotions and actions by pausing before responding. The focus will be on listening and breathing, with very little movement, so this would be a great episode to play in the car! A mindfulness story suitable for children aged 5–10 years old. “Every child is a different kind of flower and all together make this a world a beautiful garden.” Pretend to be a flower, growing out of a tiny seed into a beautiful strong plant. Today’s story is a great visualisation exercise that also introduces the life cycle of a plant and touches on the importance of diversity in both plants and people. A mindfulness story suitable for children aged 5–10 years old. Today we talk about asthma and test out how it feels like to have asthma. We also try out a breathing exercise called belly breathing that is meant to increase airflow to your lungs. Suitable for children aged 5–12 years old. Join us for a journey through the water cycle! We’re going to imagine ourselves as tiny drops of water falling from a rain cloud, rushing through a waterfall, and evaporating back up to the sky. We’ll focus on breathing, gentle movements, and visualization for this short story. Suitable for children aged 5–12 years old. What better way to calm down than to imagine that you’re a fluffy dandelion seed floating on a warm spring breeze? This relaxation story was written for children aged 5-10 years old and can be enjoyed at home or in the classroom. Use your senses and imagination to explore a special forest—your forest. We introduce the concept of shinrin-yoku, or forest bathing, and encourage everyone to go outdoors and spend time in nature. A relaxation story suitable for children ages 6–12 years old. Take a dive into the ocean of your imagination! We'll meet a dolphin, jellyfish, and even a shark! A fun relaxation story for children ages 5-10 years. A mini monkey decides to jump on you, so you'll have to stretch, breathe, and move so that the monkey jumps back off! A calm down story for children ages 4-6 years.